40 x 24 inches; 101.7 x 61 cm. Aimée de Burgh (d.1946) first appeared on the London stage in 1900, two years after her portrait was painted. Her many roles included that of an artist’s model in The Light that Failed, a play adapted from Rudyard Kipling’s novel of the same name, which ran at the Lyric Theatre in 1903. She married the actor, Leon Quartermaine, who starred as Lord Monteith in Proud Maisie, based on Scott’s The Heart of Midlothian, which was staged two years before. 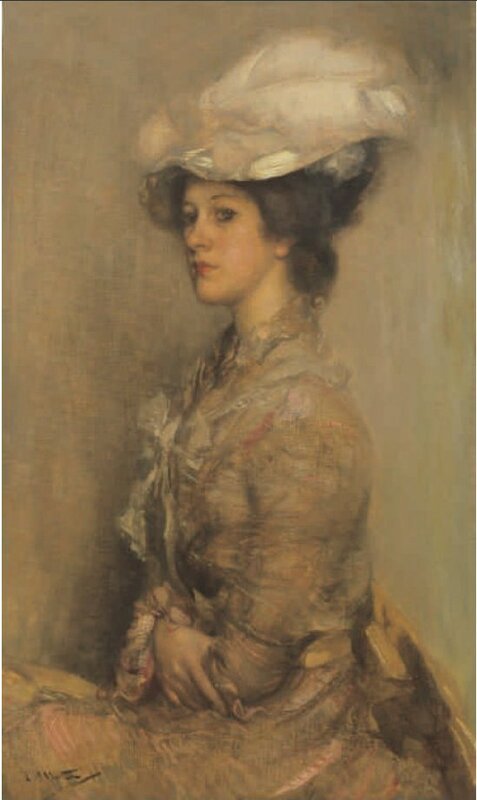 The marriage ended in divorce when Quartermaine took up with Fay Compton..
At a time when Sargent’s pyrotechnics dominated portraiture at the Royal Academy, James L. Caw declared that Walton’s portraits were ‘pervaded by a certain “shy” beauty’. Writing in 1902, he recalled ‘with pleasure’, the portrait of ‘Miss Aimée de Bourgh’, (sic) as, ‘… an exquisite exercise in white and ivory tones, associated with a pretty face and a graceful pose’ (Caw 167). Here was a painter who eschewed flashy brushwork in favour of Whistlerian decorum. While Walton responded to contemporary fashions that aped the eighteenth century in hats and hairstyles, subtle and sympathetic observation of personality characterize his treatment of Miss de Burgh. Caw, James L. ‘A Scottish Painter: E.A.Walton arsa’. The Studio 16 (August 1902): 167, 169 (illus.). McConkey, Kenneth. Lavery and the Glasgow Boys. Exhibition Catalogue. Clandeboye, County Down: The Ava Gallery; Edinburgh: Bourne Fine Art; London: The Fine Art Society, 2010. No. 22.